A bus station in front of Bến Thành Market in HCM City’s District 1. Lack of space is blamed for the shortage of terminals in the city, where buses are often parked on streets and pavements. VNS File Photo. 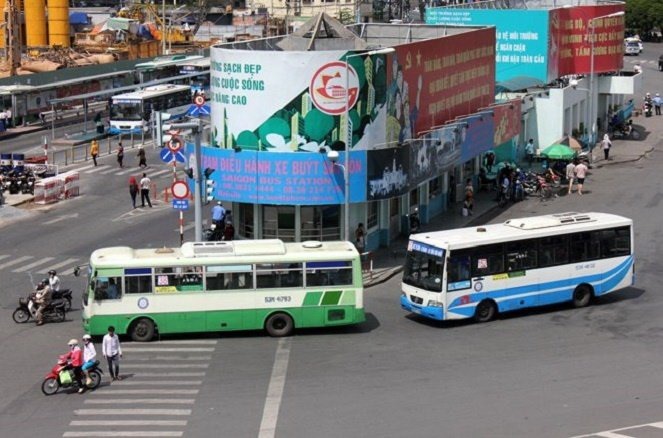 HCM CITY -- Shortage of space has been identified as the main hurdle to the development of HCM City’s bus services and lack of adequate bus stations. As a result of the shortage, half of the city’s 83 bus stations are on roads and pavements. The rest are in universities, airport and tourist parks. This causes costs to increase while causing disorder and lack of safety, Trần Chí Trung, director of the Public Passenger Transportation Management and Operation Centre, said. A station for route numbers 57 and 89 in front of Hiệp Bình High School in Thủ Đức District, for instance, increases the risk of accidents, especially at the start and end of school. Local residents also complain that the buses, lined up on one side of the road, block access to their houses and shops. Based on the transport development master plan, the city transport department and district authorities agree on the numbers and locations of bus stops and terminals in each district. However, changes are made when a district announces detailed plans for development of stops and terminals. This is the reason for the lack of investment in building bus terminals. Trung said the department has called on authorities in 16 districts to announce detailed transport development plans based on which bus terminals and stops would be developed. According to figures from the department, HCM City has 2,600 buses operating on 141 routes. Thirty new buses will be added by the end of this year. The land earmarked for transport development in the city measures 7,841ha, and for bus terminals, just 29.99ha. City authorities have given priority to construction of bus terminals, including one under the Sài Gòn Bridge. The department is preparing for construction of three bus terminals at Tân Quy, Bến Súc and An Nhơn Tây in Củ Chi District.